This spiced pumpkin pecan bread recipe is spicy, warm and moist, and really easy to make. If you don’t have pecans, you can use walnuts. I made this pumpkin spice bread immediately after making one with herbs and it’s just as easy. By this time I was getting rather hot, being a woman of a certain age, in the kitchen with the oven on, singing and dancing around getting my ingredients together. So if you would prefer not to imagine a middle-aged nutter on making this recipe, I quite understand. Fortunately, the preparation time was only about 15 minutes as I already had some cooked pumpkin on hand and I made it in the same big bowl I had out. Baking time was just under an hour and the bread is immediately ready to eat after baking, thank heavens. You'll love this spiced pumpkin pecan bread for breakfast, lunch or dinner! It's a sweet treat packed with a pumpkin flavor. Mix first 4 wet ingredients together in a big bowl with a whisk. Pour into a loaf tin, about 9 inches or whatever suitable tin you have to hand and cook in the oven at 350 degrees Fahrenheit, or 180 Celsius. Just under an hour and it was lovely and brown on top and a toothpick came out clean. I’d also cooled down enough to put my top back on you’ll be pleased to hear. One has to be rather careful around the oven otherwise! I couldn’t resist trying it straight away. It’s lovely and moist and the dark brown sugar really makes it special. Can’t wait to try it cold too, and toasted with butter melting all over it. If my memory serves me well, enjoying this the day after being baked is also quite wonderful as it has such a wonderful flavor. Sitting on the porch and having a nice cup of coffee with a piece (or two) of this amazing spiced pumpkin pecan bread sounds like the perfect way to start the day. Not to mention the fact that pecans are a great source of fiber and B Vitamins! Don’t forget to invite a friend over to share and why not try some of my other pumpkin bread recipes! Pumpkin Cranberry Bread – you can add so many different things to pumpkin bread to make it taste even more delicious! Chocolate Chip Pumpkin Bread – how about some chocolate? 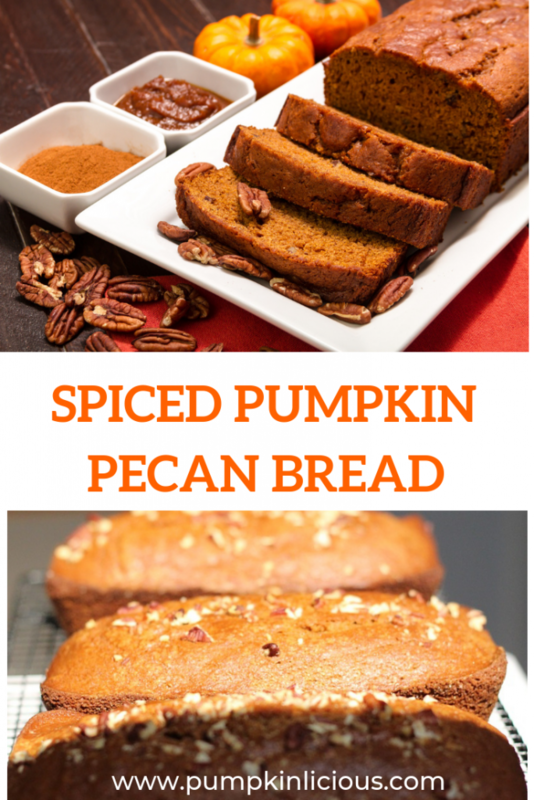 You could even add chocolate to pumpkin pecan bread to make it taste even better! 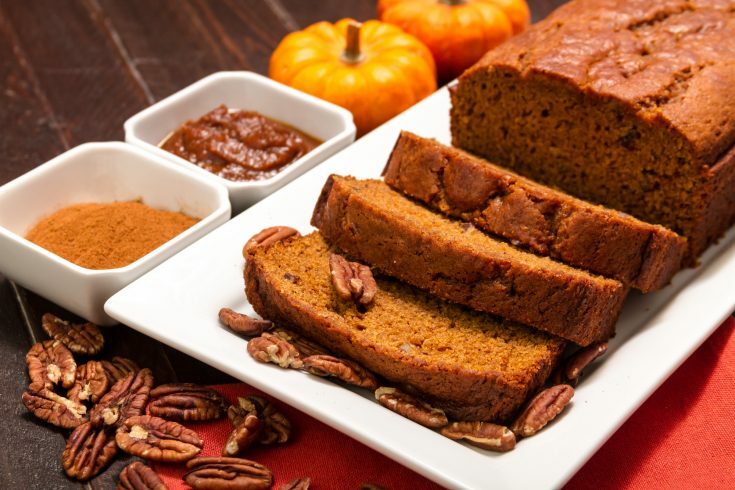 What type of nut would you add to this pumpkin bread instead of pecan?